The Presbytery of South Alabama RESOURCE CENTER is a vital aspect of this presbytery's history and strong commitment to Christian Education, discipleship and solid resourcing! When you walk in the front door of the Presbytery Office on Main Street in Daphne, you practically walk into the Resource Center itself. There are marked sections for Nursery, Children, Youth, Young Adults, Adults, Curriculum, Vacation Bible School, Faith, Worship, Stewardship, Evangelism, Presbyterian and Reformed, Spirituality and on and on! Each of these sections are filled with resources to help staff and laypersons in the various areas of ministries of congregations. 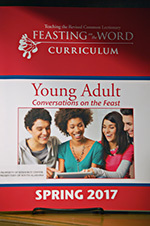 While the Resource Center is not archival as a library would be, it maintains a good collection of more classic and up-to-date resources for various aspects of ministries in the life of a congregation. Everything in the Resource Center is available for 2-week (and longer) checkout time. One only needs to be already be in the system as a patron and if not, we can take care of that right away! Individuals and churches are welcome to check out materials. In addition to curriculum, book and DVD resources, there is equipment available for checkout such as Media Projectors, biblical maps/stands, large and extra large screens, and a DVD/TV. The Presbytery of South Alabama also has a Resource person on staff, Jenny Chapman is the Education and Resource Associate. She is more than happy to work with individuals, committees or churches. You can come to the Resource Center to meet or she will gladly come to you and bring resources with her! This is YOUR wonderful Resource Center and we hope you will regularly use it and enjoy it!